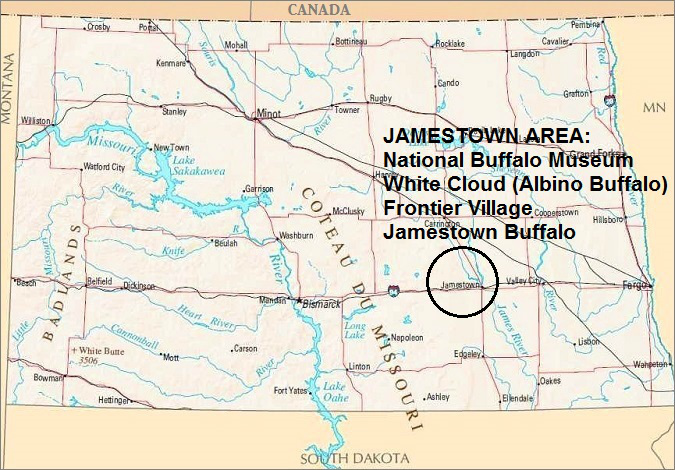 White Cloud, the famous white buffalo at Jamestown North Dakota. "must see" while vacationing in North Dakota. Albino Buffalo are extremely rare, as one albino buffalo will appear out of every 10 million buffalo births according to the National Bison Association. Living with 30 other buffalo on a 200 acre field next to the National Buffalo Museum in Jamestown North Dakota, White Cloud is well taken care of and safe from harm. Because White Cloud is a true albino, she is practically deaf and has very limited eye sight...which makes it very difficult for albino buffalo to survive in the wild. And because white buffalo are considered to be extremely sacred and are spiritually significant to Native Americans, many Native American pilgrimages have taken place to see White Cloud through the years. The fence that surrounds the land where White Cloud lives provides evidence of these pilgrimages as hundreds of prayer bundles from the thousands of Native Americans that traveled many, many miles to offer prayers and to receive blessings, are tied to the fence. 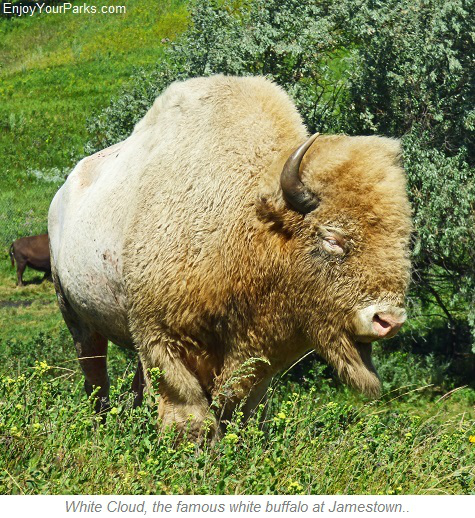 "White Cloud" was born on July 10, 1996 on the Shirek Buffalo Farm near Michigan, North Dakota, and joined the herd at the National Buffalo Museum in Jamestown in 1997. "White Cloud" has since given birth to several calves... And one of these calves is white. 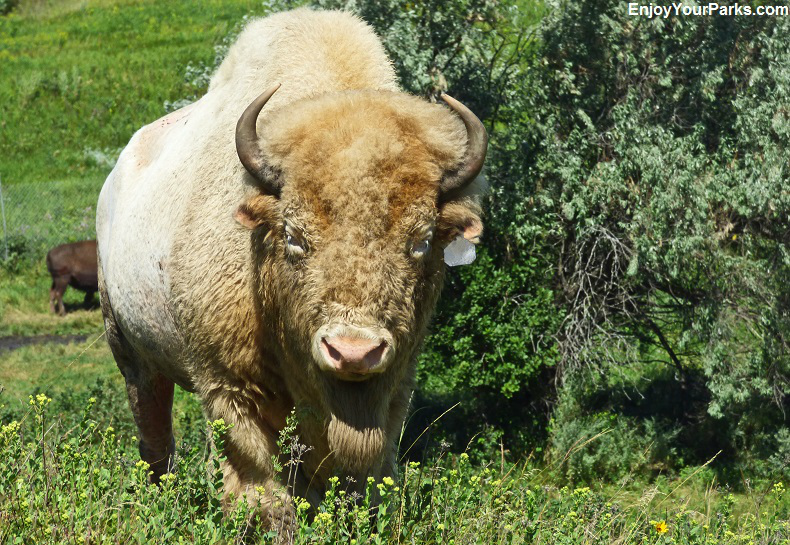 Named "Dakota Miracle", this rare buffalo is also living at the refuge at the National Buffalo Museum. whether or not Dakota Miracle is a pure albino buffalo, but recent testing indicates he may not be. 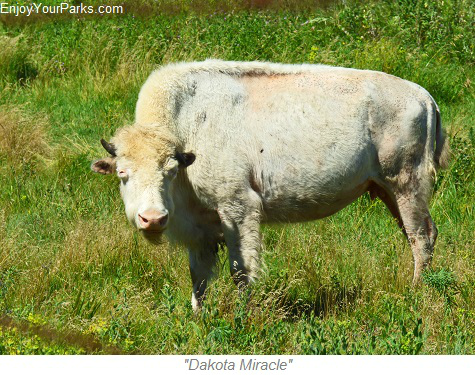 Regardless of whether or not "Dakota Miracle" is a true albino buffalo, Dakota Miracle is a gorgeous rarity and is a thrill to watch graze with White Cloud at the 200 acre refuge. 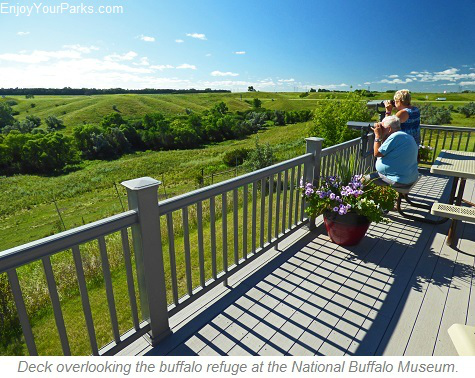 The 30+ buffalo that live on this refuge is maintained by the North Dakota Buffalo Foundation, and they can be seen from both the deck of the National Buffalo Museum, or from Interstate 94 as it passes right by the refuge. National Buffalo Museum in Jamestown, North Dakota. 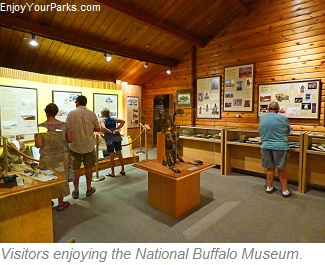 The National Buffalo Museum located at Jamestown North Dakota is a wonderful museum that primarily focuses on the history of buffalo on the Great Plains and the Great Plains culture. There are also Plains Indian artifacts, 19th century firearms used by buffalo hunters, and the prehistoric remains of an American Buffalo. 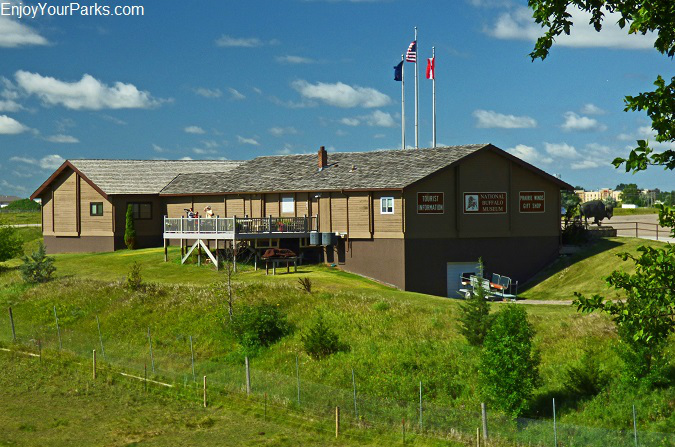 The museum is housed in a 6,000 square foot rustic log building at the edge of the popular Frontier Village in Jamestown. Our personal favorite of the museum is the large deck that overlooks the 200 acre refuges where White Cloud and her white calf Dakota Miracle roam. 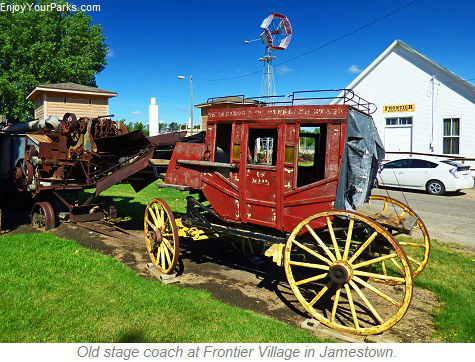 Next to the National Buffalo Museum and the albino buffalo named White Cloud in Jamestown North Dakota, is the wonderful attraction known as Frontier Village. 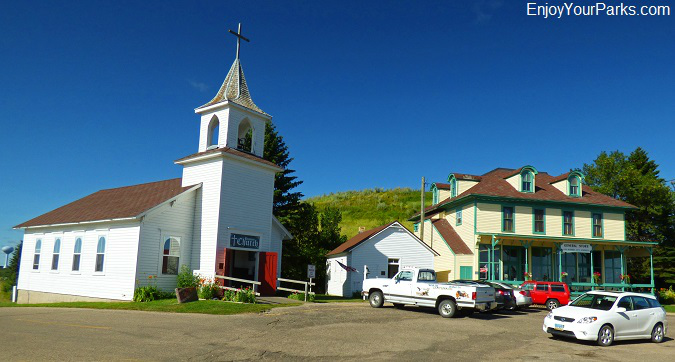 This fascinating place features original buildings from real frontier villages throughout North Dakota, and each are filled with antiques and artifacts that truly bring the Great Plains pioneers' world to life. Frontier Village does a terrific job depicting how these prairie pioneers lived, which includes not only original buildings and period antiques, but there is also Wild West Shoot-Outs and Stagecoach rides. 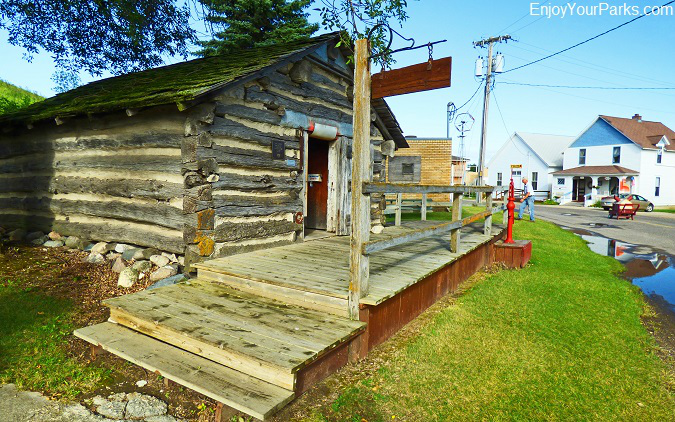 Pioneer cabin at Frontier Village in Jamestown North Dakota. Frontier Village has many fascinating old buildings full of amazing artifacts that are fun to explore! Frontier church and general store at Frontier Village in Jamestown, North Dakota. Jamestown Buffalo: "The Largest Buffalo In The World"
Located at Frontier Village in Jamestown North Dakota is the world famous Jamestown Buffalo known as "Dakota Thunder". 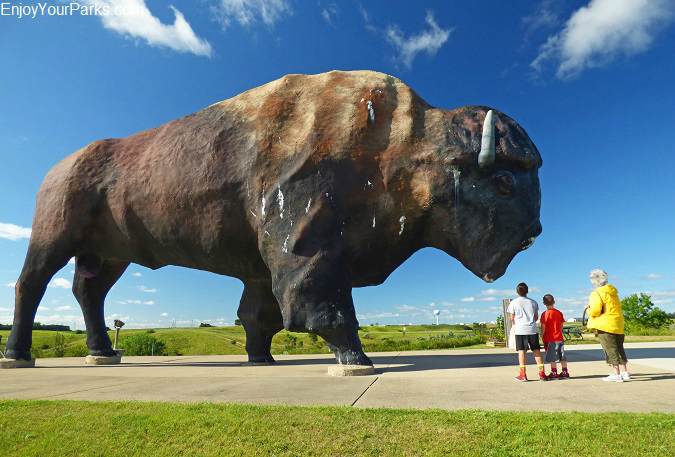 This gigantic 26 foot tall buffalo weighs 60 tons as it stands watch over the town of Jamestown North Dakota. 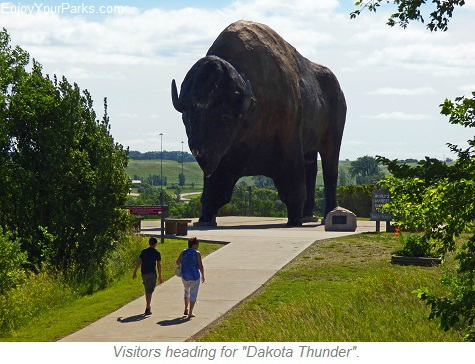 Erected in 1959 at the Jamestown Frontier Village by sculptor Elmer Peterson, Dakota Thunder is of course a very popular roadside attraction, and is yet another North Dakota icon. 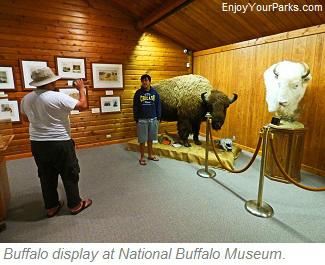 Who in the world would pass up the opportunity to get their photo taken next to "The World's Largest Buffalo"? The Jamestown Buffalo, a.k.a. "Dakota Thunder", is the largest buffalo in the world!